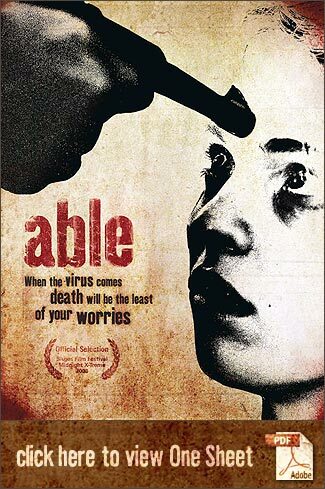 Principal Photography for Able was completed 30 October 2007. A very supportive and dedicated team effort made the aggressive production schedule possible. Director Marc Robert and Producer Will Stotler thank everyone for their extraordinary effort and contributions. Without the hard work of everyone in the Cast and on the Crew, Able 's production would have been impossible. Stotler/Robert Film thanks all location owners with whom we worked during the shooting of Able . Every owner's professionalism and willingness to work closely with us permitted Able to meet its aggressive schedule. We'd like to extend a special "thank you" to Mr. Keith Stone, owner of JADE's place, for extended use of his Yorckstrasse 70 property during production.